Barbecue Buyers Guide – A Guide To Buying A BBQ. There are many things to consider when buying a BBQ for the 1st time and even the 2nd time as well. Price will most certainly play a large part in your final decision, but sometimes cheap is cheap for a good reason. Having said that there are a stack of barbecues available in all shapes and sizes with prices tags as varied as the models, so let’s dive in and have a look at some of the factors to look for before your purchase your next BBQ. The most common barbecues would be gas BBQ’s. They are a quick and convenient way to cook up a storm and take the least amount of time to get going. The heat from gas is instant and generally only takes a couple of minutes to heat your hotplate or grill up ready for cooking. You can control the heat quickly either way by turning the knobs up or down to control the burners. Gas is cleaner burning and easy to light making cooking a lot more controlled. Gas is also the most affordable fuel your BBQ. Electric BBQ’s are designed for cooking in confined spaces (gas needs plenty of ventilation) and is convenient for cooking up a couple of steaks with no fuss. Ideally suited to people that live in an apartment and have a power source nearby, they don’t get as hot as gas or charcoal bbq’s and cost more than gas to operate. other barbees can. You can mix the charcoal up with some wood if you like to enhance the smoked flavour or just use the charcoal briquettes on their own. The downside is that preparation time can be between 20 – 45 minutes before you can start to cook. They are also the most expensive of the lot to run but it may well be worth it for the extra flavours. The cost of your new BBQ depends on a number of factors and the variation in price is as large as the range itself. You can get a small charcoal fired BBQ from under $100 right up to a full kitchen style grill worth over $2000. You just need to work out exactly how much you are going to use it, what extra features you really need, how many people you will be cooking for, what you will be cooking the most of and where your new barbecue will live. If you can answer these questions before you start, you just may end up saving yourself a small fortune and a lot of time and disappointment . It’s pointless buying a 5 or 6 burner BBQ with side burners and extra cabinets if you live in an apartment with a small patio. Yes it looks impressive but is a major overkill and you can cook a meal just as good with a smaller 3 – 4 burner that fits neatly in your available space. If you a looking at buying a charcoal fired barbecue, make sure that you have an outdoor area with plenty of ventilation to avoid inhaling smoke and dangerous gas that can be given off from the charcoal burning. Alternatively if you have limited outdoor space, not cooking for too many and still want to grill your meat, then a small electric BBQ may be just what you are looking for. Just make sure you have a good look where your new barbecue will live and purchase accordingly. The most common type of BBQ Grills are freestanding which also means they are portable (if they’re not too big) and can be taken with you if you decide to move. They are also ideal if space is a bit of a premium and generally only take up as much space as the actual unit itself. Give the stand a good shake to see how sturdy the frame is too, most of the gas grills weigh in at over 100 pounds and up to over 200 pounds so a nice strong frame is essential. Built-ins on the other hand are designed to be integrated into your outdoor entertaining area, the grill unit itself doesn’t take up a lot of room but the surrounding that will house the bbq will be a lot more substantial than a free standing unit and therefore require more space. Once they are fitted they are often hard to remove if you decide to leave. Some of the built-in grills also require a licensed contractor to install and connect so bear that in mind before making your purchase. If heating costs are likely to be an issue then you are better off purchasing a gas fired barbecue grill as these are the most efficient. Next would be electric powered units followed by charcoal grills. The charcoal beads add the most flavour to your cooking but aren’t as economical as gas or electricity and they take the longest time to heat up and be ready for grilling. If you have an idea of how many people you will regularly be cooking for, you can buy a smaller unit which will save you some dollars. If you are used to having large crowds to feed then you will definitely need one of the larger 5 – 6 burner models to the food coming. 1 – 3 people, 2 – 3 burners like the Weber Spirit E-210. 2 – 5 people, 3 – 4 burners how about the Dyna Glo 4 Burner Stainless. 5 people and more, 4 – 6 burners then look at the Weber Summit E-620. The humble BBQ Grill has come a long way in recent years as we enjoy more than just a steak or sausage cooked on the barby. Nowadays it’s possible to cook complete meals outdoors which used to be cooked inside in the oven. Roast dinners, seafood, vegetables, pizza’s, bread, you name it can all be cooked on the BBQ. Some of the larger grills with the addition of a roasting hood create the perfect oven for pizza’s and roast dinners. Cooked in a charcoal kettle grill the flavour rises to a whole new level. If you are just going to be cooking some steak or lamb chops and a few eggs then you don’t really need the addition of a roasting hood but you may be able to keep your options open and purchase one that you can add to later on. 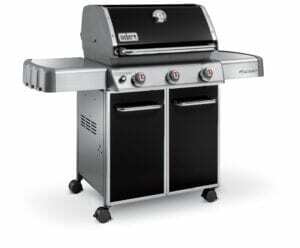 Most of the gas fired BBQ Grills can have split cooking surfaces, half hot plate and the other half grill. This is ideal for doing meat over the grill and eggs or seafood on the hot plate. If looking for a grill, make sure the burners have flame tamers over them to prevent flare ups which can blacken and burn your food. Hot plates can still be used to cook all kinds of meat but you don’t get the charred smokey flavour which is a result of the fat dripping out over the flame tamers creating flare ups. The plates and grills can be made of cast iron, stainless steel, porcelain enamel coated steel and more, each one will have advantages over the other whether it’s heat retention, easier to clean, quicker to heat up, you just need to weigh it all up. Having said that there is probably no ideal cooking surface, one will have a trade off over the other, that’s the nature of the BBQ. The trolley or cabinet that houses the freestanding BBQ’s are normally made from timber or stainless steel. Look for a sturdy unit that will go the distance. Once again good quality stainless will last a lot longer than timber, and won’t need too much maintenance to keep it looking good. Barbecues and the different parts in them are made from many different types of materials. If your grill is going to be kept outside in the weather then you should look for a sturdily constructed high quality stainless steel unit. The addition of a cover will prolong it’s life greatly. The main construction materials include pressed metal, vitreous enamel and stainless steel for the body of the BBQ, whilst the burners are made of cast iron (which provides hot even heat), stainless steel (for durability) or enamel coated cast iron for corrosion protection. The cooking surfaces are generally made from cast iron or stainless steel. Once again the stainless steel cooking surface will last longer, especially if you live near the coast where salt air could be an issue and will probably be a little bit easier to clean. The controls should be easy to turn and grip and be clearly labelled with high and low positions marked. Ideally knobs on the front of the hob which are on an angle are easier to read without having to bend over but the downside is they tend to get a bit more grease on them in the grilling process. How easy is it to light? 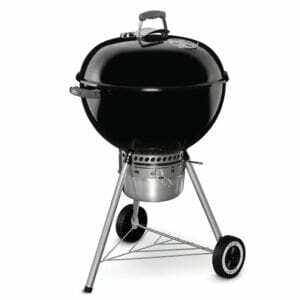 Most gas grills come with auto ignition these days which makes lighting the barby a breeze but obviously the charcoal cooker will take a fair bit more effort to light and make ready for cooking. Cleaning unfortunately is just one of those jobs that needs to be done to keep your BBQ in top shape and for safety reasons as well. Look for a unit with clean, smooth lines and not too many tight corners as this is where the grease and grime tends to accumulate and is harder to remove. Excess fat needs to drain somewhere and most good grills come with a drip tray of some description. Look for a drip tray that is easy to access for cleaning purposes as they should be emptied out regularly to stop the BBQ from going up in flames. The addition of a cover will greatly prolong the life of your barbecue grill and help to keep out the dust, dirt and moisture. Perhaps the best way to clean your new BBQ is to give it a quick clean after each use. It only takes a few minutes and will help to keep it in tip top shape for years to come. I like to turn the burners on full for about 5 minutes after I’ve finished to help burn off the excess fat and then give the grills a good scrape down with a wire brush and a little water and on the plate I will pour a little water on it to steam the excess residue off. Then wipe it down with a dry rag. Keeps it ready to go for next time as well as helps to keep the vermin away, there’s nothing worse than opening the lid to see some mouse droppings on your plate. YUK! Keep in mind that you may want to add a few bits and pieces along the way so it is a good idea to check out what accessories are available for the particular model barbecue you will buy. Here’s a few to get you started. Well there you go. Hopefully after you have read this barbecue buyers guide you will have a bit more of an idea which BBQ is ideal for you and you situation. Go check a few out and happy grilling. Yes I’m Ready To Buy, Take Me To Amazon Top Sellers NOW! TheBestBBqGrill.com is a participant in the Amazon Services LLC Associates Program, an affiliate advertising program designed to provide a means for sites to earn advertising fees by advertising and linking to amazon.com. Amazon, the Amazon logo, AmazonSupply, and the AmazonSupply logo are trademarks of Amazon.com, Inc. or its affiliates.Prices may change from those that are originally stated on this site, check latest prices before purchase.